Originally named Brunos Blues Band, this was the first band to feature Phil Miller on guitar and Pip Pyle on drums, along with Phil's brother Steve Miller (3) on keyboards and vocals, Lol Coxhill on saxophone and Roy Babbington on bass (replacing founding member Jack Monck). In 1969, after two years gigging around London, they teamed up with singer Carol Grimes, and the following year recorded the album Fools Meeting. In January 1971, Pip Pyle left and was replaced by Laurie Allan. Delivery broke up soon after and metamorphosed into DC & The MB's (Dyble-Coxhill & The Miller Brothers), with Judy Dyble (ex-Fairport Convention) on vocals, a largely improvisational line-up which toured Holland in May 1971. In August 1972, Steve Miller resurrected Delivery with a line-up of himself, his brother Phil, Pip Pyle and Richard Sinclair on bass, which resulted in a couple of tracks on the Coxhill-Miller album released the following year. 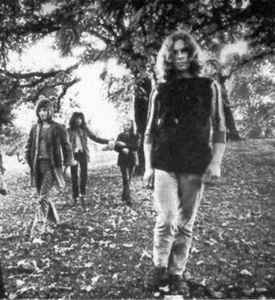 When the latter three musicians went on to form Hatfield And The North, yet another (final) version of Delivery was assembled by Steve Miller, this time with the returning Lol Coxhill, Roy Babbington and Laurie Allan, but Babbington then joined Soft Machine and Miller and Coxhill carried on as a duo, with occasional participation from Allan. Delivery was resurrected for a one-off gig at London's Vortex jazz bar on June 29th, 1998 (with a line-up of Steve Miller, Phil Miller, Lol Coxhill, Pip Pyle, Carol Grimes and Fred Baker); this was a benefit for Steve Miller, who sadly died of cancer six months later.